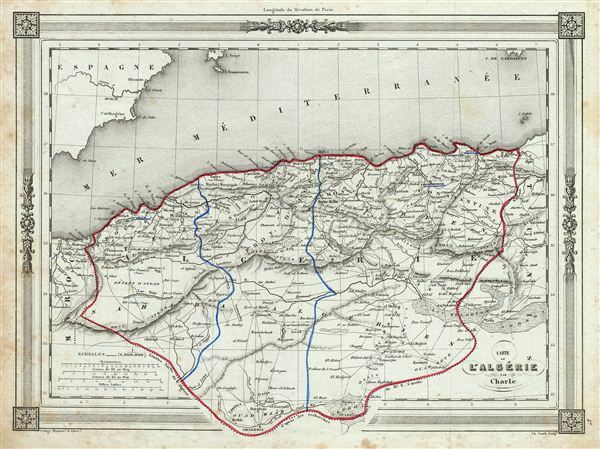 An uncommon and extremely attractive 1852 map of Algeria. The French colony of Algeria is depicted divided into the administrative districts of Oran, Alger and Constantine. The map also includes adjacent portions of Morocco in the west and Tunis in the east. Throughout, the map identifies various cities, towns, rivers and assortment of additional topographical details. After being captured by the French in 1830, Algeria became an attractive destination for european immigrants. However the majority indigenous Muslim population was dissatisfied with the political system. This dissatisfaction would ultimately trigger the Algerian War lead to Algeria's independence. The map features a beautiful frame style border. Prepared by Charle for publication as plate no. 27 in Maison Basset's 1852 edition of Atlas Illustre Destine a l'enseignement de la Geographie elementaire.